The RM140 Mini Ring Light is a low-angle ring light that works best for dark field ring applications. The RM140 series features a sealed, IP65-rated aluminum housing. The RM140 series includes Smart Vision Lights’ built-in Multi-Drive™ constant current driver that allows the light to operate continuously or in OverDrive™ strobe mode. Smart Vision Lights, a leading designer and manufacturer of high-brightness LED lights for industrial applications, introduces its most advanced LED mini ring light — the RM140. The compact and powerful RM140 Mini Ring Light is a low-angle ring light that works best for dark field ring applications. The light can also be used for radial illumination. The RM140 series features a sealed, IP65-rated aluminum housing and includes Smart Vision Lights’ built-in Multi-Drive™ constant current driver that allows the light to operate continuously or in OverDrive™ strobe mode. In addition, by regulating the current delivered to the LEDs and limiting their duty cycle, the Multi-Drive protects the high-intensity LEDs from premature degradation and failure caused by excessive heat. The industry-standard 5-pin M12 connector makes for simple wiring since external wiring to a driver is unnecessary, and the 1–10 V DC analog control line gives the user total control over intensity when running the light in constant operation. The RM140 also offers overcurrent protection, as well as PNP and NPN strobe input. Standard wavelength colors are white, 470 nm blue, 530 nm green, and 625 nm red. Additional wavelengths are available upon request. 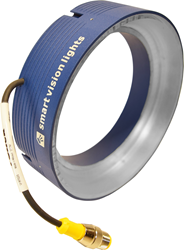 For more information about the RM140, visit smartvisionlights.com/products/mini-ring-lights.